This has languished in a drawer for a couple of years. I have just had a look at it - and realised that the movement is a bit strange. 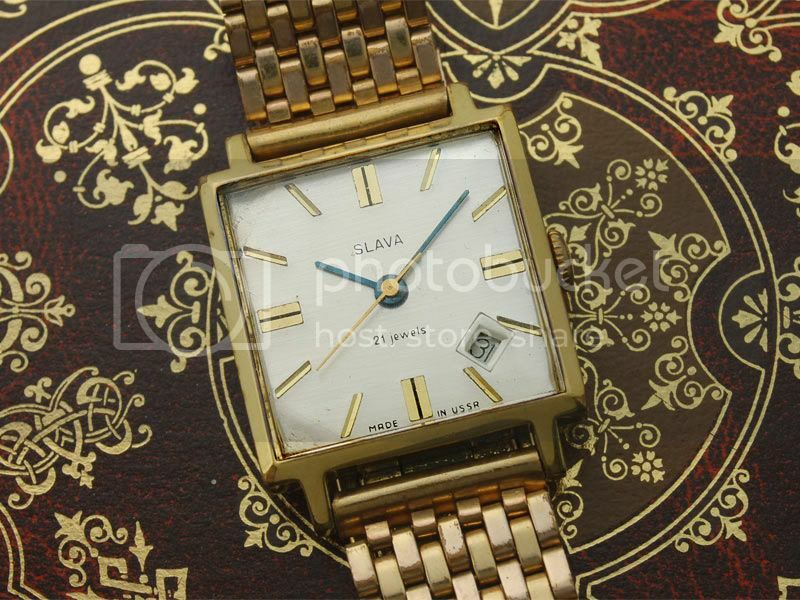 In fact, its a Slava (2nd Moscow watch factory) 2414! The strap's a bit odd too. You slide the tongue under the other part - with the clasp on - and it lies invisibly against the skin. Neat, but fiddly. the whole watch looks like a Slava. That's definitely its cousin if not its brother. I have a Slava just like it. Just an odd tacky gold but a very interesting piece. Raketa also has one exactly the same - I almost think every russian brand at that era had the same case and movement but only changed out the name on the dial as even the dials are the same. It is a Slava. The 'Sekonda' brand was created by ChasProm in 1966 for the export of the best watches from all the USSR's watch factories, including Slava. Most Sekondas were sold in Britain and the British Commonwealth. In 1993, Sekonda UK bought the rights to the brand and ceased buying watches from Russia or Belarus. That's when Sekonda got boring. From the early 1980s, some quartz watches were being made for Sekonda in Hong Kong. It is a Slava. The 'Sekonda' brand was created by ChasProm in 1966 for the export of the best watches from all the USSR's watch factories, including Slava. Most Sekondas were sold in Britain and the British Commonwealth. The problem with Sekonda as a brand in the UK is that it was marketed as being cheaper - much cheaper -than Swiss watches. So, although successful, it had a downmarket image that still persists. I had one in the 70's. Vintage Sekondas never go for much. The problem with Sekonda as a brand in the UK is that it was marketed as being cheaper - much cheaper -than Swiss watches. So, although successful, it had a downmarket image that still persists. Ironic really when you consider that they were usually vastly superior to Swiss watches in the same price bracket. Vintage Sekondas never go for much. Ha! You wouldn't say that if you were bidding from Australia. Wel, I've just done a completed listings check for 'vintage Sekonda' - and you must have been very unlucky. what is the principle behind a double barreled movement? obviously the winding assembly looks very different to the standard 'big gear little gear' set up we normally see. does this watch have two mainsprings? "What it does offer however is a more even torque over most of the total power reserve i.e. the spring that drives the train is being constantly charged up to near full winding by the second spring. So long as the second spring can deliver enough torque to the primary spring for a bit more than 24 hours (the time between hand-winding) then isochronism is achieved. In other words, it has the same time-keeping benefit as auto-winding."